The next upcoming Tisha B'Av starts on sundown of August 10 ending at sundown on Sunday August 11th, 2019. Tisha B'Av is celebrated in the Hebrew calendar on ninth day of the month of Av. The day is a day of remembrance of the destruction of the First and Second Temple in Jerusalem. Many will fast, pray and abstain from pleasure seeking activities as well as not wash or bath. 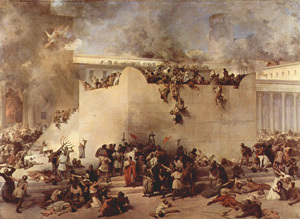 The Babylonians in 586 BCE destroyed the First temple and later the Romans in 70 CE destroyed the second temple all on the ninth day of Av creating the remembrance day of Tisha B'Av. There are other years were other tragedies occurred on the same day and are also part of the overall commemoration of the day.